Product code: W1491cc Categories: Omega Watches, Watches. Vintage Omega watches have become so sought after, and here is a very stylish 18ct Omega Grand Luxe Constellation Calendar watch dating from 1966 that will always look so good on the wrist day or night. The Omega Constellation range has always been the top of the line series by Omega and also the model that uses their highest grade of chronometer movements, so it is no surprise that not only does this have the 24 jewelled automatic calibre 562 movement, but also the dial itself is solid 18 carat gold. And then to top it off, the index makers have onyx inlays. All of this showcases why not only Omega but also the Omega Constellation has always been so sought after. The case measures 40mm by 34mm across plus the Omega crown, and the case at the lugs has a soft curve see on the Grand Luxe models. In fantastic condition and completely serviced and with our twelve month warranty, this is a great example of a vintage Omega Constellation that has so many talking points to it. The progenitor of the Constellation line is without doubt the appropriately named “Century”. A limited edition self-winding chronometer wristwatch launched in 1948 to celebrate the firm’s 100th anniversary. This watch, not intended for series production, was greeted with such enthusiasm that the decision was taken to create a watch with all the same qualities on an industrial scale. It started with the movements, which were all self-winding chronometers that had received the mention of “Especially good results” during testing. The line would soon develop into a series of watches which were finished to different degrees. 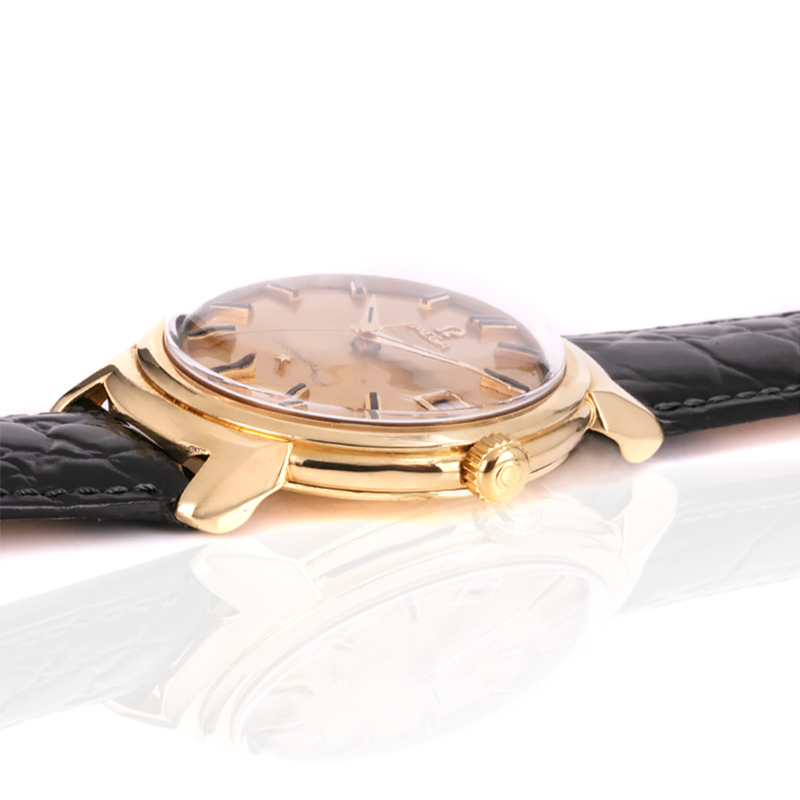 The Constellation Deluxe was available in gold with applied gold indexes on the dial. And finally the Constellation Grand Luxe, which was available in gold and platinum with corresponding dial and the so-called “Brick link” bracelet. 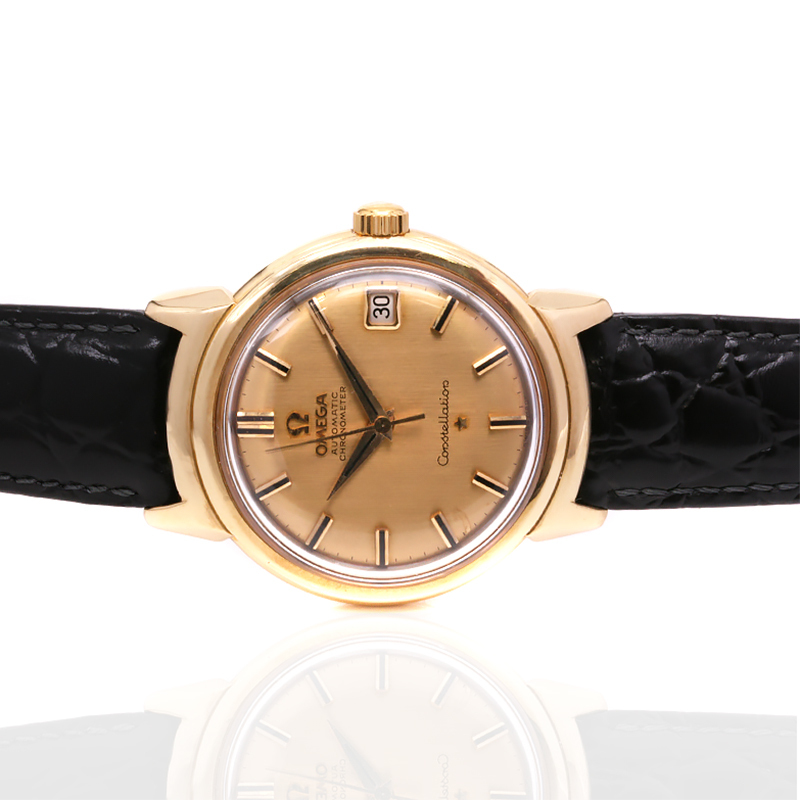 The form of the Constellation remained little changed until 1964 when the so-called “C-case” watches were introduced. The name was a reference to the form of the case, which resembled two interlocked Cs. The change would also be incorporated in the first ladies’ Constellation, launched in 1967. The 1970s saw the introduction of quartz technology to the wristwatch and this also applied to the Constellation line. Some of the most accurate watches ever produced in series were developed for the Constellation line, including the famous Marine Chronometer which is, to this day, the most accurate autonomous wristwatch and the only watch to be certified as a marine chronometer. However it wasn’t a Constellation Marine chronometer that stunned the watchmaking world with a 0 error rating. It was a calibre 1021 self-winding movement destined for a Constellation that held the distinction of achieving absolute perfection when it received its certificate marked “Especially good results”, showing a variation of 0.00 after 15 days of testing in five positions and at varying temperatures.